Robert Rauschenberg was born on October 22, 1925 in Port Arthur, Texas. Rauschenberg went to art school at the Kansas City Art Institute, the Academie Julian in Paris France and Black Mountain College in North Carolina. 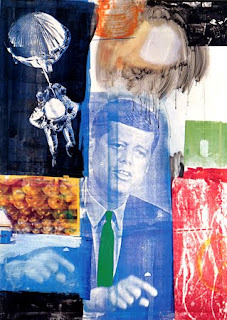 Rauschenberg was part of the following art movements: Pop Art Rauschenberg’s most famous work is Retroactive I painted in 1964. 1. His mother used to make him clothes out of scraps of fabric. 2. He used silk-screening techniques in his artwork and Mr. Rauschenberg frequently alluded to cars and spaceships, even incorporating real tires and bicycles into his art. 3. When he was a kid, he thought he would be a minister or a pharmacist when he grew up. Rauschenberg died on May 12, 2008 in Captiva, FL.